This is the beginning of a compilation of family members who served in the American, Canadian, British and French forces during World War I. More names will be added over time, along with service photos, when possible. Draft cards of 688 members of the family are on file. See how you can get one. Those whose names appear in red died during the war. seaman 2nd class, of Ansonia, Conn.
Pelican Bay Park, N.Y., from Aug. 19, 1918, to Sept. 27, 1918. Hospital, Pelican Bay Park from Sept. 27, 1918, to Nov. 11, 1918. Inactive duty Dec. 31, 1918, Pelican Bay Park. lieutenant, machinegunner, of Ansonia, Conn., and Sarasota, Fla.
Called into service Dec. 15, 1917. Officers Reserve Corps. Became a 1st lieutenant Sept. 15, 1918. He was a 2nd Infantry machinegunner until his discharge Dec. 19, 1918. He was buried at Sarasota Memorial Park. private, Canadian expeditionary forces; of St. Catherine, Ontario, and Tucson, Ariz.. He worked for General Hospital No. 3; the attestation papers he signed March 23, 1915, state that he was a cook before entering the service. He was buried at Tucson's Evergreen Memorial Park. colonel, of San Diego, Calif. Served in the infantry. A career soldier, he also served in World War II and the Korean War. He is buried at Long Island National Cemetery in Farmingdale, N.Y.
of Janesville, Wis., Sioux Falls, S.D., and Long Beach, Calif.. He was member of the 102nd Machine Gun Battalion, 26th Infantry Division. He died of his wounds Nov. 10, 1918, and was buried at the Meuse-Argonne American Cemetery at Romagne, France. (Plot A, Row 7, Grave 15) His name is on a marker at Hamden's old town hall. physician, of St. Albans, Vt.; Bridgeport, Conn.
Enlisted Jan. 30, 1918, at Burlington, Vt. Medical Enlisted Reserve Corps. Discharged Dec. 17, 1918. Company M, 45th USV. He is buried at Los Angeles National Cemetery. Registered for the draft in Florida but unsure if he served during the war. He enlisted in 1900 and was discharged in 1905, serving aboard the Constellation, the Menongahala, the Vermont, the Franklin and the Illinois. He filed for a pension Feb. 1, 1929. Army Air Corps; of Chadbourn, N.C., and Redondo Beach, Calif. He was an instructor in stunt flying for the Army at West Point, Miss. He was killed in the crash of a mail plane and buried at Forest Lawn in Glendale, Calif.
corporal; of Long Beach, Calif.. He was a member of the 364th Infantry Regiment, 91st Infantry Division. He was killed in action Sept. 26, 1918, in France and buried at the Meuse-Argonne American Cemetery (Plot E, Row 43, Grave 2) at Romagne, France. As a major in the 90th Division's 345th Field Artillery, he commanded the 1st Battalion. He also served in World War II and was buried at Ft. Sam Houston National Cemetery at San Antonio. He served in Co. B, 356th Infantry, and Co. E, 138th Infantry, He was killed in action. His tombstone is at Pleasant Grove Church Cemetery in Warrensburg, Mo. of Fulton, Dexterville and Hannibal, N.Y. He served in the front-line trenches in France, where he was gassed. After a month in the hospital he was discharged from active service and given a position in the hospital kitchen. His brother Norman also served. 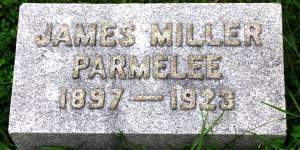 He was buried at Hannibal Village Cemetery. His brother Ezra also served. corporal, of Tekamah, Neb., and Los Angeles. While working for Ambulance Section 566, he was awarded the Croce al Merito di Guerre (War Merit Cross), right, for bravery in ambulance work in Italy. Under almost constant bombardment at their billet in Bassano, he and others were subjected to enemy batteries as they made their daily 9-mile drive in the Brent Valley to the front-line dressing stations. Recognition of their work was accorded by the Italian authorities on Dec. 31, 1918. Inducted into the Army at Rochester, N.Y., on Nov. 8, 1918. Made a private March 3, 1919. He was an M.D. until his discharge on Oct. 28, 1919. He was a member of an ambulance crew, Section 617. He was buried in Butterfield's Mount Pleasant Cemetery. He is buried at Willamette National Cemetery, Happy Valley, Ore., just outside of Portland. nurse, of Morristown, N.Y., and Hinsdale, Worthington and Springfield, Mass. One of six women in the war to receive the Distinguished Service Cross, right. Although wounded in air raid in France in 1917, she continued to serve throughout the emergency. His brother Edgar also served. private, Army; of Cobden, Ill.
Company G, 10th Infantry. He was buried at Cobden Cemetery. His brother Van also served. sergeant first class, Aero Squadron; of Canandaigua, N.Y. He was buried at Canandiagua's Woodlawn Cemetery. Company G, 1st OLA. He is buried at Los Angeles National Cemetery. Inducted into the Army at Canaan on July 25, 1918. 151st Depot Brigade on Aug. 5, 1918. Company F, 74th Infantry until his discharge on Dec. 1, 1918. Enlisted in the National Guard at New London, Conn., on May 19, 1917. 1st Company Coast Ant. Troops in Connecticut National Guard. Battery A, 68th Artillery, Coast Art Corps until his discharge on Feb. 27, 1919, at Camp Wadsworth, N.Y. Overseas Aug. 9, 1918 to Feb. 16, 1919.
private; of Paterson, N.J., Buffalo, N.Y., and Ft. Myers, Fla.
As an infantryman, he was severely wounded, captured by German forces and subsequently liberated by advancing French troops. Member of the 1st/4th Battalion, the King's Own Yorkshire Light Infantry. Died Oct. 16, 1917; buried at the Communal Cemetery at Wimereau, Pas de-Calais, France. sergeant, of Iron Mountain, Mich., Oshkosch, Wisc., Washington, D.C. and Chicago. Served in the Marine Corps. private 1st class, Waterbury, Conn.
Inducted into the Army at New Milford on Nov. 15, 1917. Mechanic in the Motor Transport Company; Repair Shop Unit 301 until his discharge. Made a bugler on Aug. 5, 1918; private on Jan. 21, 1919; private first-class on March 5, 1919. American Expeditionary Forces from Jan. 4, 1918, to June 11, 1919. Discharged on June 18, 1919. Inducted into the Army in 1917. 151st Depot Brigade until his discharge Dec. 4, 1918. He was buried at Middletown's Pine Grove Cemetery. 496 Arco Squadron, American Expeditionary Forces in France. Enlisted in the Army Reserve at Ft. Slocum, N.Y., on April 3, 1918. Made a private on Aug. 9, 1918. An MD through Nov. 10, 1918. Central Officers Training School at Camp Lee, Va., until his discharge Nov. 23, 1918. He was buried at Nacogdoches' Rock Springs Cemetery. lieutenant commander, Navy; of San Diego, Calif. He was a 1913 graduate of the U.S. Naval Academy and also served in World War II. private; of New Haven, Conn., and Monterey, Calif.
A member of the 3rd Battalion, 63rd Infantry, Company I. The unit was organized in May, 1918, trained and given its overseas equipment, but the armistice was signed almost on the eve of its departure. private, Army; of Pittsburg and Columbus, Kan. He was buried at Columbus' Park Cemetery. D Company, 1st New York Light Artillery. He is buried at Los Angeles National Cemetery. A captain in 1914, he was promoted to major in France in 1916. He was awarded the French Croix da Guerre (French War Cross), with Bronze WTA; and the King's Silver Jubilee Medal in 1935. He served with the Corps Troops Supply Column, from April 10, 1916, to April 14, 1918, which was then absorbed by the Corps Troops Mechanical Transport Company, from April 15, 1918, to March 18, 1919. He served in Section 2 of the Ambulance Service in Italy. ambulance driver, second lieutenant in the French Foreign Legion; of Buffalo, N.Y. He left Harvard in May, 1917, to join the American Field Service Unit, driving an ambulance with the French Army on the Champagne Front. He drove a Red Cross ambulance with the Italian army on the Piave Front from November, 1917, until April, 1918, when he enlisted as a private in the Foreign Legion. He was sent to a French artillery school at Fontainebleau, appointed aspirant (cadet) on Aug. 14 and assigned to the 43rd Battery, 275th Field Artillery. He was commissioned sous-lieutenant (second lieutenant) on March 15, 1919, and discharged May 22, 1919. His engagements included Reims, Hunding Stellung and Aisne. He was decorated with the Croix de Guerre (French War Cross), above, and the Italian Military Medal. James was working as assistant manager of the cashier's department for Guaranty Trust Service when he was accidentally shot and killed on a Paris street by a policeman; his body was shipped back to New York on the Mauretania, sister ship of the Lusitania. He was buried at Buffalo's Forest Lawn Cemetery. 1st/7th Battalions, Northumberland Fusiliers. Died Sept. 16, 1916. Buried at Dernancourt Communal Cemetery Extention, Somme, France. sergeant, Army; of Knoxville, Memphis and Nashville, Tenn. He was in the 114th Infantry and cited by Gen. Pershing for capturing 16 enemy soldiers. of Somerville and Paterson, N.J. He served in Sections 2 and 3 of the Red Cross Ambulance Service in Italy. He was buried at Riverview Cemetery at Trenton, N.J..
His draft card notes that he enlisted in the Navy on Jan. 10, 1918. C Company, 12th Battalion, Durham Light Infantry. Died July 17, 1916. Buried at Thiepual Memorial, Somme, France. 3rd Field Artillery Brigade, 9th Battery. "Old Joe," who lived with wife Alice at 75 Woodgate St., in South Melbourne, was a member of the in the Australian Imperial Force. His enlistment papers, dated Aug. 27, 1914, state that he had served for a year in the Greenwich Reserve of the 1st King's Dragoon Guards in England. sergeant; of Council Bluffs, Iowa, and Los Angeles, Calif. He served from Dec. 14, 1917, through Dec. 24, 1918, and was buried at Council Bluffs' Walnut Hill Cemetery. sergeant, of St. Albans, Vt., and Franklin Lakes, N.J.
Enlisted Dec. 4, 1917, at Ft. Slocum, N.Y. 398th Motor Transport Company; private on March 8, 1918; corporal on March 11, 1918; sergeant on April 1, 1919; overseas March 28, 1918 to May 20, 1919; discharged June 2, 1919.
sergeant, Army; of Pelham and Coalmont, Tenn. He was buried at Lasater Cemetery in Sequatchie, Tenn.
lance corporal; of St. Helens, Lancashire, England. 9th Battalion, Duke of Wellington's (West Riding) Regiment. Died Oct. 12, 1918. In the 1911 census of St. Helens, he was a 16-year-old bottle maker, living at 127 Cooper St. Buried at Selridge British Cemetery, Montay, Nord, France. Enlisted June 18, 1917, at Ft. Ethan Allan; Company C 1st Vermont Infantry to Sept. 7, 1917; Company E 101st Ammunition Train to discharge; corporal on July 3, 1917; private on Aug. 5, 1917; first-class private on May 1, 1918; overseas Oct. 2, 1917, to April 23, 1919. He was severely wounded on Oct. 1, 1918, and discharged May 9, 1919.
chief warrant officer, Navy; of Ivorytown and Hartford, Conn. He served in the Navy for 27 years, from the final days of World War I through World War II. His obituary. He received a Purple Heart after taking shrapnel in a leg. He was in Company G of Kansas' 3rd Infantry. Died of illness Nov. 19, 1918, in France. 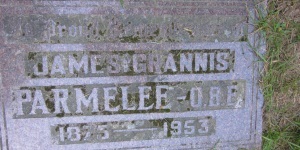 A nephew, Miles Edward, died in World War II. 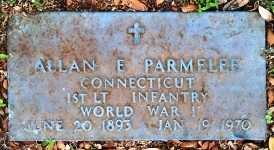 He was buried at Cook-Walden Capital Parks Cemetery at Pflugerville, Texas. He enlisted in September, 1917, and served with the provost guard company. He was discharged Aug. 23, 1919, at Camp Dix, N.J. His brother Earl also served. of Normal, Ill., and Washington, D.C.
private, of West Granby, Conn.
Inducted into the Army at Thompsonville on May 1, 1918. Company H, 113th Infantry. Made a private Dec. 1, 1918. American Expeditionary Forces June 15, 1918, to May 20, 1919. Discharged May 27, 1919. Enlisted in Cass County, Neb. He was with the Company H, 18th Infantry Regiment, 1st Infantry Division. He was killed May 3, 1918, and buried at Somme American Cemetery (Plot D, Row 16, Grave 1), at Bony, France. private; of Grand Rapids, Mich. He was a member of the 28th Infantry Regiment, 1st Infantry Division. He was killed May 29, 1918, in France and buried at the Somme American Cemetery (Plot C, Row 17, Grave 3), at Bony, France. Enlisted July 1, 1918, and served through Sept. 11, 1919. He was buried at Los Angeles' National Cemetery. Canadian expeditionary forces, of Waterloo, Quebec, and Ottawa, Ontario. He enlisted April 17, 1916, at Ottawa. Killed in France on Oct. 14, 1918. He was buried at Elk Spring Cemetery in Monticello, Ky., almost three years later, on Sept. 17, 1921.
major, medical corps; of Centralia, Ill., and Little Rock, Ark. He was a doctor in the medical corps and was buried at Little Rock's Roselawn Cemetery. Battery A, 7th Artillery Regiment. He was buried at Cobden Cemetery. His brother Fountain also served. 2nd lieutenant; of Hartford and Windsor, Conn., and Sarasota, Fla.
Enlisted in the National Guard on Dec. 9, 1914, at New Haven. Troop B, Cavalry, Connecticut National Guard (Company B 101st Machinegun Battalion). Army Candidate School. American Expeditionary Forces until his discharge on Sept. 30, 1918. In 1916, he served in the Mexican border campaign. 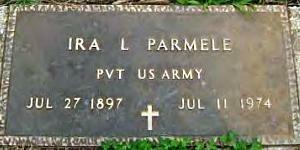 He was made a private on Jan. 22, 1917, corporal on March 8, 1917; sergeant on April 28, 1917; 1st sergeant on Feb. 1, 1918. Appointed a 2nd lieutenant on Oct. 1, 1918 in the 309th Machinegun Battalion until his discharge on Oct. 20, 1918. Saw action at Champagne-Marne; Aisne-Marne; wounded in action at Meuse-Argonne on Oct. 20, 1918. Discharged Aug. 22, 1919. The Dec. 27, 1917, issue of The Lowell (Ind.) Tribune lists Walter Parmlee as serving in the Army -- is this him? 4th Battalion, Border Regiment.Buried at the North Gate War Cemetery just outside Baghdad, Iraq. He served with the 18th Company, 5th Regiment (Marines), 2nd Division, and was killed in action at Chateau-Thierry, France, on June 6, 1918. He was awarded the Distinguished Service Cross, right, and the Navy Cross for his efforts that day. He was buried next to his father at Newton's Union Cemetery. corporal, of New London, Conn.
Coast Art. Corps. Connecticut National Guard, 32nd Company, Long Island Sound to June 1, 1918. Battery A, 68th Arty. to his discharge. Wagoner on June 1, 1918. Made a corporal on Nov. 1, 1918. American Expeditionary Forces from Aug. 9, 1918 to Feb. 16, 1919. Discharged Feb. 27, 1919, at Camp Wadsworth, N.Y.
private, of Colebrook and Fairfield, Conn., and Mt. Dora, Fla.
Inducted Nov. 7, 1917, at Fairfield. Company C. 301st Signal Battalion. American Expeditionary Forces from June 10, 1918, to May 27, 1919. Discharged June 3, 1919. According to one cousin, he was gassed during the war and had problems with his lungs for the rest of his life, one of the reasons the family moved to Florida. 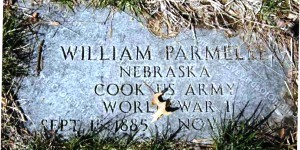 He was buried at Omaha's Prospect Hill Cemetery. private, of Salisbury and Falls Village (Canaan), Conn., and Sheffield, Mass. He was buried at Sand Hill Cemetery in Falls Village.